From Octagon to Triangle – We have a Solution! Specialty shaped windows, such as arches, octagons & ovals have become a popular architectural feature in many new home designs today. While these specialty shapes add charm and character to your home, they can also offer a particular set of challenges when it comes to privacy and light control. Blind Advantage has answers for all your challenges with a variety of different options, allowing for a broad range of light filtering and privacy possibilities. Arches come in many different sizes and go by many different names including stationary, extended, half circle, quarter circle, perfect, imperfect and eyebrow. One popular choice is The EasyView® from Hunter Douglas, it’s revolutionary design allows you to raise and lower the shade. 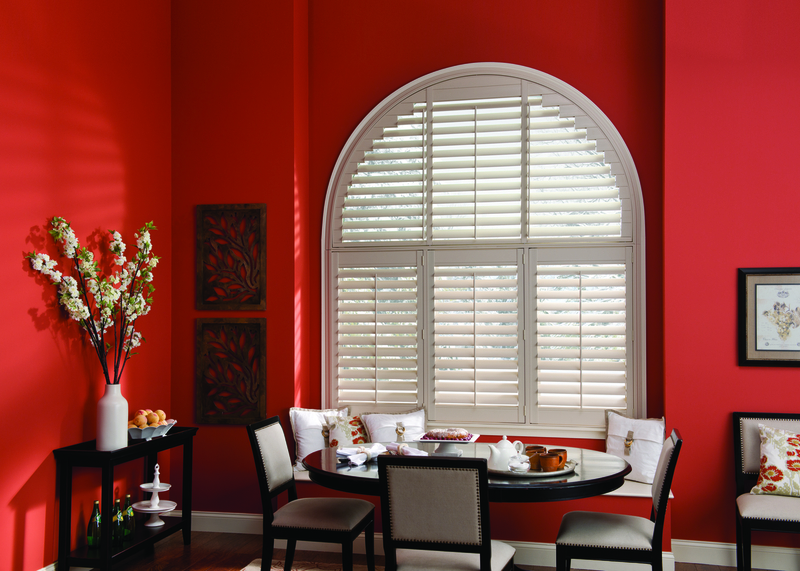 Another popular choice is a shutter. Available in a non operational fan style or a fully operational “sharks tooth” style allowing the vanes to open and close just like other shutters. Common in contemporary homes, angled windows bring up some unique challenges in providing privacy and light control and keeping your home energy efficient. We can offer you a wide selection of products from Hunter that help to enhance the beauty of your angled windows whether the shade is open or closed. Angled windows come in many variations including right triangles, isosceles triangles. These unique window shapes are not as common as other specialty window shapes but not to fear, Blind Advantage offers you the opportunity to cover these unique window applications. Products available through Hunter Douglas such as Country Woods®, Duette® and Applause® honeycomb shades and Brilliance® pleated shades offer many versatile and durable options to help you cover even the most unusually shaped window.